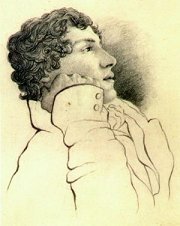 Charles Brown (1787-1842) was Keats’s closest friend. They met in the summer of 1817 and went on a walking holiday of Scotland together. Keats moved into Brown’s home at Wentworth Place after Tom Keats’s death. Brown illegally married their Irish housekeeper (with whom he had an illegitimate son) in late 1819 and left on a solitary holiday to Scotland in May 1820. He and Keats never met again, though the poet hoped that Brown would accompany him to Italy. Brown emigrated to New Zealand in 1841 and died a year later. This is Keats’s last surviving letter. He died on Friday, 23 February 1821, around 11:00 pm. Keats’s companion, Joseph Severn, also wrote numerous letters to their friends in England; click here to read a selection. They are the definitive account of Keats’s final months. ‘Tis the most difficult thing in the world to me to write a letter. My stomach continues so bad, that I feel it worse on opening any book, – yet I am much better than I was in Quarantine. Then I am afraid to encounter the proing and conning of any thing interesting to me in England. I have an habitual feeling of my real life having past, and that I am leading a posthumous existence. God knows how it would have been – but it appears to me – however, I will not speak of that subject. I must have been at Bedhampton nearly at the time you were writing to me from Chichester – how unfortunate – and to pass on the river too! There was my star predominant! I cannot answer any thing in your letter, which followed me from Naples to Rome, because I am afraid to look it over again. I am so weak (in mind) that I cannot bear the sight of any hand writing of a friend I love so much as I do you. Yet I ride the little horse, – and, at my worst, even in Quarantine, summoned up more puns, in a sort of desperation, in one week than in any year of. my life. There is one thought enough to kill me – I have been well, healthy, alert &c, walking with her – and now – the knowledge of contrast, feeling for light and shade, all that information (primitive sense) necessary for a poem are great enemies to the recovery of the stomach. There, you rogue, I put you to the torture, – but you must bring your philosophy to bear – as I do mine, really – or how should I be able to live? Dr Clarke is very attentive to me; he says, there is very little the matter with my lungs, but my stomach, he says is very bad. I am well disappointed in hearing good news from George, – for it runs in my head we shall all die young. I have not written to x x x x x yet, which he must think very neglectful; being anxious to send him a good account of my health, I have delayed it from week to week. If I recover, I will do all in my power to correct the mistakes made during sickness; and if I should not, all my faults will be forgiven. I shall write to x x x to-morrow, or next day. I will write to x x x x x in the middle of next week. Servern is very well, though he leads so dull a life with me. Remember me to all friends, and tell x x x x I should not have left London without taking leave of him, but from being so low in body and mind. Write to George as soon as you receive this, and tell him how I am, as far as you can guess; – and also a note to my sister – who walks about my imagination like a ghost – she is so like Tom. I can scarcely bid you good bye even in a letter. I always made an awkward bow. Notes: The Xs in the letter represent names marked out by Brown or a later copyist.